Note from shop owner Welcome to Mythology! Our shop is temporarily closed so we can enjoy the holidays with our family. 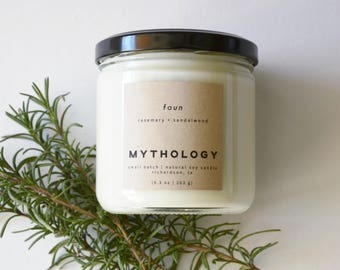 If you need to reach us, please email mythologycandles [!at] gmail.com. Thanks! Welcome to Mythology! Our shop is temporarily closed so we can enjoy the holidays with our family. If you need to reach us, please email mythologycandles [!at] gmail.com. Thanks! Love the smell, it doesn't smell artificial or too overpowering. Our FAUN soy candle marries smooth, rich sandalwood with the crisp scent of rosemary and thyme for a scent that is fresh and cleansing. One of our Etsy bestsellers! Men love our natural soy candles just as much as women do- but you won’t find any gimmicks here. (Sorry if you love bacon- and beer- scented candles. It’s just not our thing.) Instead, you’ll find good, clean, honest scents rooted in nature. Just a few of the things that go into making our natural soy candles- including the most important- my journal of secrets! While I keep track of our perfected formulas digitally, I need to be able to scribble down ideas when I experiment! I make all of our candles in Richardson, TX, where I live with my husband, son, and black cat Spooky. When I'm not working, I love reading, cross-stitching, watching historical romances, and planning our next adventures. My husband Andrew handles the legal and administrative side of Mythology LLC. He's also my chief scent guinea pig! We're happy to discuss personalized or custom orders. Please contact us through Etsy or mythologycandles@gmail.com for more information. Please note there may be additional charges for custom work, and we generally do not do private labeling. 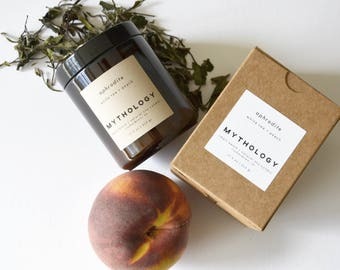 For information on stocking Mythology candles in your brick and mortar store please contact us through Etsy or mythologycandles@gmail.com. We use all-natural soy wax for its clean-burning properties and ecological benefits. However, soy candles behave differently than traditional petroleum-based paraffin candles. For best results, keep these tips in mind. -Keep the wick trimmed to ¼”. You should examine your wick every time you light your candle. -While it's important to keep your wick trimmed, trimming it too low will result in a weak flame. If this occurs, pour out a small amount of melted wax to allow the wick to breathe. -Burn your candle for 2-3 hours each time you use it. Candles have a memory! For the initial use, allow the melt pool to reach the edges of the container. This will prevent “tunneling,” and allow your candle to last longer with a better scent throw. -Keep candles away from children, pets, curtains, and other flammable objects. -If the flame in your candle is too high, blow it out and trim the wick. We are required to collect sales tax for all orders in the state of Texas. In order to be as eco-friendly as possible, we occasionally ship candles in recycled boxes. If this is an issue, please let us know ahead of time and we'll be happy to accommodate your request for an unused shipping box. Many of our candles are shipped with packing peanuts. Rest-assured that we will only use eco-friendly, biodegradable peanuts. Never styrofoam. All candles are shipped on either Monday or Tuesday through USPS Priority Mail with tracking. We do this to minimize candles melting when shipping in the summer heat. Returns and exchanges will only be accepted if the candle is returned in it's original, unused condition. You must contact us within 14 days of delivery and ship the candle back within 30 days of delivery. The buyer is responsible for all return shipping fees. Custom orders and items bought on sale may not be returned. Of course, we always want you to have a 5-star experience. If you are unhappy with your purchase, please reach out to us! The health of our environment is important to us. Please recycle any packaging and re-use the container the candle came in. They make great toiletry holders or small planters! To re-use glass and aluminum containers, simply melt out the wax with hot water or a hair dryer.